On Friday, the Futures Game rosters were announced. We learned a couple of weeks ago that Torii Hunter would manage the USA team while David Ortiz will manage the World Team. Also on Hunter’s coaching staff will be Matthew LeCroy (bench coach), LaTroy Hawkins (pitching coach), and Miracle hitting coach Steve Singleton (hitting coach). Representing the Twins on Team USA will be Miracle outfielder Alex Kirilloff. Representing the Twins and Australia on the World Team will be LHP Lewis Thorpe. The Twins acquired minor league outfielder Jon Kemmer from the Astros. The 27-year-old has played in AAA the last three seasons. He is a left-handed hitting corner outfielder. The Twins activated utility man Taylor Motter and optioned him to AA Chattanooga. The decision to send him to Chattanooga rather than Rochester is because the Red Wings start their All-Star break on Monday and they want Motter to play. Gabriel Moya reported back to Rochester. Luke Bard was placed on the disabled list (calf). Ft. Myers activated OF Shane Carrier on Friday. And before we go further, a quick fireworks show for Tom Froemming, a huge fireworks enthusiast (or not really). The Red Wings got the offense, but not quite enough pitching or defense in this game. Kohl Stewart made his second Red Wings start of the season. He gave up five runs on seven hits in five innings. He walked two and struck out five. Two of the hits left the ballpark, including one from former Red Wings outfielder Danny Ortiz. Trevor May walked one in an otherwise uneventful outing. Gabriel Moya struck out two batters over two scoreless innings. Alan Busenitz pitched a scoreless ninth inning, but he gave up two runs (both deemed unearned) in the 10th inning to take the loss. LaMonte Wade led the offense. He went 2-for-3 with two walks and his third home run of the season. Nick Gordon went 2-for-5 with his eighth double and his second Red Wing home run. Kennys Vargas went 2-for-5 with his tenth double. While the Lookouts were unable to garner much offense in this game, there were some interesting notes from the game. Luis Arraez made his first start for Chattanooga and recorded his first hit. Zander Wiel went 2-for-4. Jaylin Davis went 1-for-3 with a walk and drove in the lone run for the Lookouts. Lefty Anthony Marzi fell to 0-6 for Chattanooga, but he pitched better than he has of late. He was charged with three runs on seven hits and two walks in five innings. However, he also had 11 strikeouts. In his previous start, he went five innings without recording any strikeouts, and his 11 strikeouts on Friday night equaled his strikeout total over his previous four starts. Another lefty, Andrew Vasquez came on in relief. He walked one and struck out three over two hitless, scoreless innings. He has yet to give up an earned run over his first ten innings with the Lookouts this season, including 8 1/3 innings over his four appearance since returning following the Florida State League All Star game. A third lefty, Ryne Harper, struck out four batters over the final two innings. Things got a little feisty when the Miracle and Bradenton played on Friday night. Three members of the Miracle were ejected in the eighth inning. The Miracle took a 5-4 lead in the eighth frame when Lewin Diaz hit the go-ahead home run. The next batter was the red-hot Caleb Hamilton who was called out on strikes and was ejected. Soon after, his manager Ramon Borrego was tossed. Tom Hackimer was in the game for the bottom of the eighth inning. After getting the first out, he proceeded to hit the next three batters. After a force out at home and a fly out, the inning ended without the tying run scoring, Hackimer was ejected as he left the field. Tyler Wells was the story early in the game. He retired the first 16 batters that he faced. In total, he gave up two runs on three hits over six innings. He struck out eight without a walk. Colton Davis came on and gave up two runs on two hits and a walk before Hackimer was brought in. He got the final two outs of the seventh before his eighth inning. Alex Robinson came on for the ninth inning and pitched a perfect inning for the save. Lewin Diaz was the offensive hero. He went 3-for-4 with his 11th double and his sixth home run, which proved to be the game-winner. Caleb Hamilton was 2-for-4 in the game. Alex Kirilloff batted in the leadoff spot for the first time and went 1-for-5. Miguel Sano was 1-for-4 in the game. Not much scoring in this game. In fact, the lone run in the game was unearned. Blayne Enlow worked a career-high six shutout innings. He worked out of some jams as he gave up six hits, walked three and hit one. He struck out three. Melvi Acosta worked the final two innings. He was charged with the unearned run on three hits. He struck out two. The Kernels managed just five hits in the game. Jacob Pearson moved into the leadoff spot when Akil Baddoo was a late scratch from the lineup. Pearson went 2-for-3 with a walk. Andrew Bechtold hit his 13th double. Trey Cabbage had a single and walked once. This game was been postponed by rain as the weather affected several games in the Appalachian League on Friday night. The GCL Twins got a little hitting and a little pitching, enough to come out of this game with a little win. Landon Leach started for the Twins. The 2017 draft pick went two scoreless innings. He didn’t give up a hit, but he did walk three and struck out two. Donny Breek came on and also threw two scoreless innings. He walked two, hit one and struck out two. Frandy Torres gave up one run on two hits, a walk and a hit batter over 1 2/3 innings. He struck out three. Amilcar Cruz gave up one run on one hit, one walk and two hit batters. He struck out one. Tanner Howell came in and got the final seven outs to record the save. He gave up one hit, walked one and struck out two. 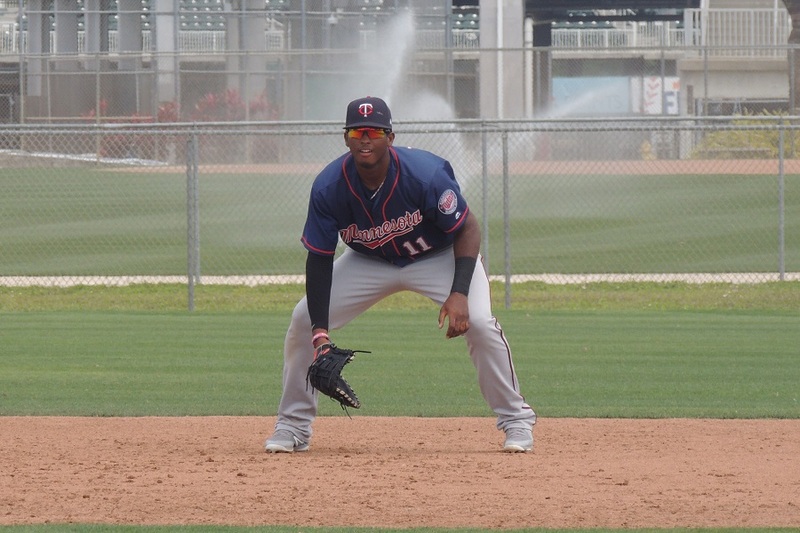 Here’s a look at how the Twins Daily Top 20 Twins Prospects performed. Please note that we will be updating our Top Prospect rankings so this list will be updated soon. #20 - Felix Jorge (Chattanooga) - DFAd and Released (though he did become a father on Friday, so congratulations to him. The Twins also grabbed JON KEMMER from the Astros for cash. A guy who ahs the potential to be a minor league free agent if not added to the 40-man in the of season. He shows some punch with his bat. Added. Thank you for the reminder. Thanks for the view of your northern neighbors Seth! 1)Lewis Thorpe is only 22? 3)This is going to sound strange, but there is one American player listed at less than 190. There are 7 players on the International squad listed at 170 or below. And one kid is listed at 6’3”, 160lbs. Exactly how is that possible? And one kid is listed at 6’3”, 160lbs. Exactly how is that possible? I was young once, too. I always look skeptically at PCL numbers. OPS in the .800 range two out of three years there, and another above .900, doesn't inspire me too much. Fresno's not at high altitude, but his road numbers the past two seasons look inflated. He won't get the same helium in major league parks. But, perhaps, we have found our next Robbie Grossman anyway. A Houston farmhand who walks a fair bit and plays only corner outfield. I can't wait. Don't mistake these views for outrage. Teams sign minor leaguers all the time. It's no biggie. Two things stuck out to me in the report - we acquired a 27 year old "LEFT HANDED" outfielder. Have we run out of outfielders?Is this another case where the FO does not want to call up our own minor leaguers - LaMonte Wade comes to mind? "The Twins activated utility man Taylor Motter and optioned him to AA Chattanooga. The decision to send him to Chattanooga rather than Rochester is because the Red Wings start their All Star break on Monday and they want Motter to play. "Why do they want him to play so quickly, are we missing him on the major league team? Dumpster diving is okay once in a while, but I hope we can do better than these two moves. Enlow is pitcher of the day? I would think a perfect game into the 6th inning with the first 16 sat down and 8k is more deserving. So another dominant start for Wells, yet still no promotion? What does he have to do? Pitch a no-no? I seriously think even within the Twins organization Wells is a highly underrated prospect. All he’s done is pitch great in every level thus far and continues to improve year after year. Oh by the way Wells now is #30 on the MLB Pipeline prospect list. I mean, I don't get adding another LH Hitting OF either. Obviously it cost nothing, but you've already got Granite and Buxton and Wade and Corcino in the OF in Rochester. Guessing Buxton comes up relatively soon, so they may need another OF, which is fine. Very minor move. As for Motter, I personally like having a guy like that on the roster, especially if you have a short bench because he can play all four infield spots and all four outfield spots. Does he have upside? No. Can he be a quality/decent utility guy? Sure. Is it better if he's in the minor leagues getting at bats than in the big leagues? Probably. Yeah, I went back and forth on it... Wells has been a frequent pitcher of the day and deserving so again. But, I think most teams would take 0 runs in 6 innings over 2 runs in 6 innings most days. It's a results versus peripherals thing, I guess. I'm pretty sure the Twins front office and evaluators know exactly what they have in Wells. They also know what he's working on and what he does well. I don't know why he hasn't received a promotion, but they obviously feel what is best for him long-term is to still be in Ft. Myers. I can't pretend to know enough about it to know why he's in Ft. Myers and not in Chattanooga, and I'm comfortable with that. Great seeing Enlow have a very good start.With his plus curveball, a bit surprised he had only 3 strikeouts.But seeing him do well at Cedar Rapids is very encouraging. Also good to see Wade performing, well like Wade, at AAA.Gotta believe he will be with the Twins sometime this year, perhaps in September. With Arraez taking the big step to AA, will be watching closely to see if he can settle in and hit like he has throughout his career.If he can, the Twins have their lead off hitter for much of the next decade. And this Pearson kid just keeps hitting.Getting to the point that it is no longer a small sample.Nice pickup by the front office last winter, real nice. Want to echo the comments about a promotion for Wells. I only pretend to know things, but why isn't he being challenged at the next level at this point? There have been several promotions as of late. But it still feels like we are being a bit slow with some guys. Nice to see Landon Leach on the mound.And as far as promotions, some guys seem to be promoted quickly, others seem to be promoted slowly.Almost as if the FO is doing something other than scouting the box scores. Regarding Wells promotion. Marzi is 0-7 with a 7 era and is still there. Yes he had a great strikeout game with 11k in 5 but that doesn’t win games. I think it’s time to swap spots with someone with a 5+ era and get Wells a shot to see if he can continue his dominance in every level he’s been in. He is at the top or near the top of every league he’s been in for ERA and Whip and average against. I saw the ETA is 2020 but if he continues I don’t see why we couldn’t get a peek in 2019 in the bigs. he can play all four infield spots and all four outfield spots. Maybe the Twins are on to something with that 4th outfield slot. And recall that most of Leach’s experience comes against Canadian high schoolers. Thanks- Do you mean #30 for the Twins? I note that whoever did the review dinged his change up. So, I am guessing they are holding him back until he develops a third (and maybe fourth) pitch. I almost assume that Chris Carter had an opt-out of his deal and the Twins obviously weren't going to call him up, so they probably were just looking for someone to help the Red Wings. Doesn't seem like the type that would get a call up. @caninatl04 Wells has 4 solid pitches , in fact he already has 3 very good pitches- a fast ball they can’t seem to square up on very well at all, ridiculous curve, very good slider, and just “good” change up. You obviously haven’t seen him play much. I might promote Wells too, but he will have plenty of opportunity to rise quickly if he truly starts dominating and missing bats. He's not Rule 5 eligible until after the 2019 season. That's been my listed measurements since I was 17!